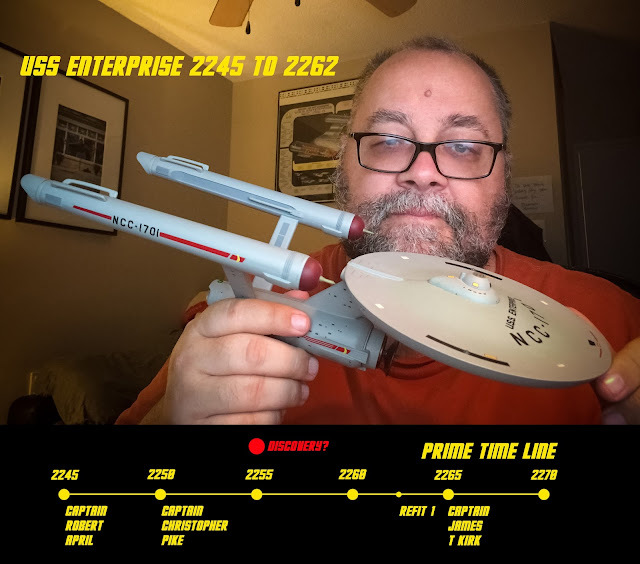 Trek Geek: Lets Get It Right.... This Is A ReBoot! To all the people looking forward to Discovery great! Im sure it will be an awesome show that hundreds of people have put in hard work on…. You may be new to Star Trek or just a casual fan and how it looks or plays out may not affect you… please watch in bliss! Just a very small selection of the books I have bought! I am not one of those fans…. I'm a little more invested in the show… I started when it first aired on TV… I saw every episode the night it originally aired…. 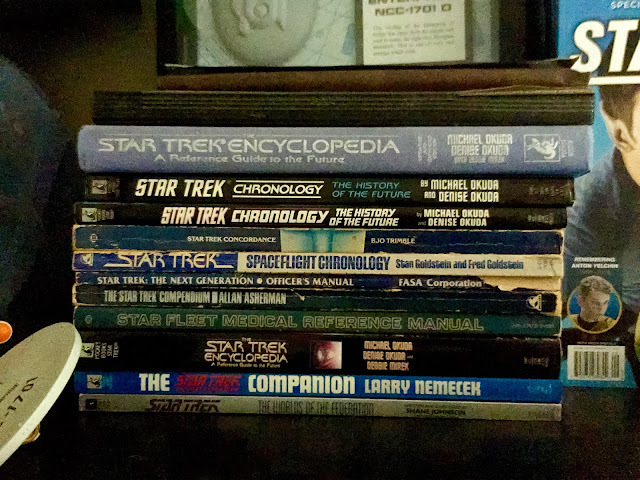 It was awesome but sometime along 1970 fandom and the powers to be started adding to the story… first with some blue prints and then a tech manual… and then over the years more books came out starting with the original concordance and ending up most recently with a 2 volume encyclopedia! Carefully gleaned fictional facts and historical record from over 750 hours of Star Trek programing… Every reference point and fictional turn in the story. Technical manuals and CD Roms ….iPad apps that contain the thousands of facts carefully laid out in the form of LCARS screens…. Ship Models, Props, Uniforms…. An entire universe carefully crafted for the most discerning fan to fully envelope themselves in. And when I say I am invested… I am, both Intellectually and financially…. So as you can see the argument over the look of this new show could cause many of us fans to be a bit disappointed and actually a bit angry to see the neophytes at CBS to wreak havoc over our carefully Paramount created world. When JJ came out it was a bit of the same feeling but we were pleasantly surprised when JJ took the alternate timeline/universe route… We even had Mr. Spock to bridge the two…. all ended up fine…. Even JJs version of Star Wars connected totally to the original… Rogue One Amazing!!! So clearly the case of Galactica and Star Wars the fans were largely respected and the shows were a success shows that changed the story and look and feel were not as successful. It should be mentioned that The Next Gen episode Relics Deep Space Nines episode Trials and Tribulations and Enterprises A mirror Darkly parts one and two were some of the highest watched episodes of Trek to date all featured the original Enterprise! Finally more proof of this can be found in many of the Star Trek Fan produced episodes, new voyages, ST Continues and culminating in Axinar which clearly show such massive fan approval that CBS shuttered them from making more full episodes! This new show Discovery takes place in 2255 and features ships, aliens, equipment and storylines that have nothing to do with our again carefully crafted universe… Spock never once mentioned a human sister, Klingons never looked so alien to both versions we enjoyed and so neatly explained in Star Trek Enterprise. The ships bear little or no resemblance to the ships of that era… The costumes bear little or no resemblance… and the introduction of Harry Mudd so early in the timeline just makes no sense and promises to be the new Dr. Smith of sci fi….. This argument could end today…right now with no more troll hater posts if CBS would just say the Discovery was a reboot, reimagining of the Star Trek Universe period. Everyone could walk away from that pretty happy knowing that their time invested in the universe crafted and packaged and sold to over 50 years was not being trashed by a network who refused to buy the show the first time it came out!